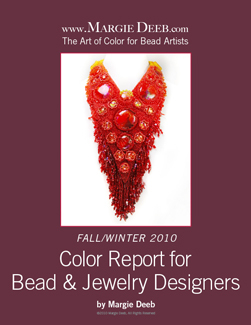 The Fall 2010 Color Report for Bead & Jewelry Designers is here! 40 palettes, pages of gorgeous jewelry created with Pantone’s 10 seasonal colors, explanations, how to work with colors, inspiration and eye candy galore! You can download a FREE preview before you buy. Look how Kristie Roeder of Artisan Clay blog has let the Color Report inspire her work! Speaking of color palettes – I have been looking at your books and am trying to decide which one is best for me if not both. I have been beading for many years now but would like to improve my knowledge and understanding of colour. I actually put a post on my blog asking fellow beaders which book they would recommend and got a mixed response. Another fellow beader, Marcie Abney has challenged me to buy the Beader’s Color Palette and take part in her weekly color challenge so I am undecided which to buy if not both! Anyway I am sure you can highly recommend both books but which would you suggest as a newcomer to learning more about color? I have looked at both books on Amazon to see how they differ but am still unsure! Any advice you have would be immensely appreciated. The Beader’s Guide to Color is more academic in approach: it covers the color wheel, the emotional and psychological aspects of color, and much more.If you really want a more thorough knowledge of color, I recommend this one. The Beader’s Color Palette is about turning colors you see around you into workable palettes. More instant gratification color. And lots of inspiration. There are free previews on my website for you to download, if you like. I hope my explanation makes sense to you – if not, ask more questions. I will be much quicker to respond. I apologize for taking so long to respond to your post. Thanks so much for your reply. I ended up ordering The Beader’s Color Palette as I thought it was going to be more about actually using the color palettes than learning about the color. I think down the track I will purchase Beader’s Guide to Color also but for the time being can’t wait to have a play with the color palettes! Thanks so much for taking the time to reply to my question. You were right about The Beader’s Color Palette – good choice for you at this time. If you want to learn more about color without spending money, I have 5 years of archived color columns on my site. They are in the “MARGIE’s MUSE” section of the website. You can download as many as you want and learn all kinds of things!